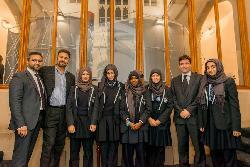 Mosaic arranged for five budding doctors and dentists from the Manchester Islamic High School for Girls to attend ‘Re-energising the NHS: An Evening with the Rt Hon Andy Burnham MP, Shadow Health Secretary’. The event was part of Mosaic’s involvement with The Patchwork Foundation; a politically neutral organisation that aims to promote and encourage the positive integration of deprived and minority communities into British political society. The event, held at the British Muslim Heritage Centre in Manchester and sponsored by AMS Medical Accountants, brought together over 200 healthcare professionals from across the UK covering a whole range of NHS arenas including GPs, consultants, dentists and commissioners. Mosaic board members and other supporters were invited to this event. The five students were the first to greet the dignitaries when they arrived at the BMHC. On the arrival of Andy Burnham MP, the five student were able to share their thoughts with the Shadow Health Secretary on the future of the NHS. The students also met with Nazir Afzal OBE, Her Majesty’s Chief Crown Prosecutor for the North of England and Chairman of Mosaic North West and Lord Keith Bradley, Chairman of The Christie Hospital. Fatima Alkali from the Manchester Islamic High School for Girls was the first person to ask a question of the Shadow Health Secretary. Fatima told Andy Burnham MP that she hoped to one day be a doctor and asked him how we can ensure that the NHS remains as compassionate as it always has been so that by the time that she begins her working life it remains the envy of the world. Andy Burnham MP remarked how hugely impressed he was with the questions.